The City of Alexandria is an independently incorporated city with no county association comprised of 15 square miles across the Potomac from Washington, D.C. 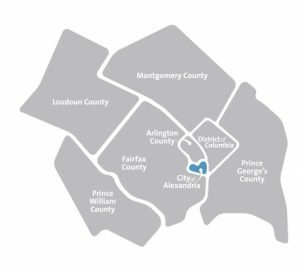 It is bounded by Arlington County to the north, Fairfax County to the south and west, and the District of Columbia to the east. In July 2015, the county had a total estimated population of 153,511, a 9.6% increase from April 2010. According to the U.S. Census Bureau, 52.1% of Alexandria residents identify as white, 21.5% as black, 16.7% as Hispanic, and 7% as Asian. Alexandria‘s white population is 80% of the rate in Virginia and its Hispanic population is almost twice as large. Compared to Virginia, it has similarly-sized black and Asian populations. The median household income is $89,177, higher than the statewide median of $64,792. Fewer Alexandria residents live in poverty—9.1% compared to 11.2% in Virginia; however, 58.9% of students are approved for a free or reduced-price school lunch, compared to 41.9% of children across Virginia. According to the County Health Rankings and Roadmaps, the City of Alexandria ranks 10th highest of 133 Virginia counties based on length and quality of life measures. The average life expectancy is 78.1 years of age, slightly below the state life expectancy of 79 years. The infant mortality rate is 5.1 per 1000 live births, lower than Virginia’s rate of 5.7 per 1000 live births. Cancer is the leading cause of death amongst Alexandria residents. 8% of adults in Alexandria have diabetes, compared to 9% statewide. The HIV prevalence rate is 810.9 cases per 100,000 people, which is almost three times Virginia’s rate of 298.5, and the highest rate in northern Virginia. This prevalence rate does not correlate with the prevalence rate for all other sexually transmitted infections combined, which is 371.9, less than Virginia’s rate of 407. For males, the high HIV prevalence rate, as well as transmission of new HIV diagnoses, is primarily driven by male-to-male sexual contact, and for females, these rates are driven by heterosexual contact. HIV disproportionately affects black residents in the area, who have a prevalence rate of 2669.5 cases per 100,000 people. Men also have a disproportionately high prevalence rate (1561) as do Hispanic residents (847.8). Although health indicators assist in understanding the health of a particular population, they do not tell the whole story. For example, at exit 4 on I-325, city residents living in Alexandria West (census tract 2001.05) have an average life expectancy of 79. Within the census tract, the median household income is $44,624, 30.8% of residents hold at least a bachelor’s degree, 52.8% of residents are black, and 3.6% are Hispanic. In the Historic District on the other side of Alexandria (census tract 2020.01), life expectancy is 85. In this census district, the median household income is $159,732; 84.6% of residents hold at least a bachelor’s degree; and only 1.3% of residents identify as black, and none as Hispanic. Other measures of health tell similar stories of inequity when broken down by race: black residents have an infant mortality rate nearly 4 times greater than that of white residents. Amongst Medicare beneficiaries 65+, black residents have an increased rate of hospitalization due to high blood pressure both when compared to other black Virginians, as well as other white or Hispanic residents of Alexandria. Black residents also have a higher rate of hospitalization due to heart disease. Within the City of Alexandria, there are significant disparities in health amongst people of different races, ethnicities, and incomes. These differences can be partially attributed to social determinants of health, which, according to the World Health Organization, are the conditions in which people are born, grow, work, live, and age. Although Alexandria has a number of health resources, accessing health services proves challenging for some county residents. There is one primary care physician for every 1,500 city residents. Although there is no widely accepted optimal rate of physicians to total population, the northernmost portion of Potomac West has been designated by HRSA as a medically underserved area, meaning it contains fewer than 1 physician for every 3,500 residents Neighborhood Health, a rapidly-growing Federally Qualified Health Center (FQHC), has 4 clinics located in Alexandria. The not-for-profit Inova Healthcare System serves the city at two locations: Inova Alexandria Hospital, a 318-bed community hospital, and Inova Mount Vernon Hospital, a 237-bed facility. Additionally, Inova Jupiter has a comprehensive HIV/AIDS clinic in the city. Alexandria’s local public health system provides many services, including family planning; HIV/AIDS services; immunizations; refugee services; nutrition and women, infants, and children (WIC); OB/GYN; pregnancy testing; STIs; teen wellness; and tuberculosis clinics. Alexandria also supports a school-based health center at T.C. Williams High School that provides primary health care to students and their families. In addition to geography, cost may be a barrier for the 14% of Alexandria residents who are uninsured. Although this rate is on par with Virginia’s average of 14%, it remains higher than the averages of neighboring West Virginia (8%), Washington, DC (4%) and Maryland (7%), where Medicaid was expanded. Those without insurance or resources to pay for care rely on safety-net health care clinics for primary health care services. Although Alexandria’s residents are generally healthy, inequities persist. Making Alexandria a healthier place for all to live requires not only expanding wellness initiatives and access to quality healthcare, but also addressing the economic and social well-being of its citizens.